I have been meaning to write something about holy week, but to be honest, was so completely swamped that I never had time to sit and blog. Well, with class cancelled tomorrow, I finally have time to write a bit about my reflections on holy week. First of all, at the Cathedral of the Holy Cross, where I work, I sang in a Tenebrae office on wednesday, Maundy Thursday service, Good Friday mass, and Easter Mass. Yes, as I told Eva, holy week is lucrative for church musicians. Like like tax season for accountants, christmas for retail, and valentines day for florists, holy week for a church musician is what pays the bills and makes ends meet. I used to feel bad about this, but considering in a few weeks I’ll be job hunting as my responsibilities will be reduced for summer months, I can use the extra pay. Enough money talk, onto spiritual reflections. 51 At that moment the curtain of the temple was torn in two from top to bottom. The earth shook, the rocks split 52 and the tombs broke open. The bodies of many holy people who had died were raised to life.53 They came out of the tombs after Jesus’ resurrection and[e] went into the holy city and appeared to many people. With the lights out, the pitch-less rumbling shook the walls of the cathedral, and brilliant flourishes on the manuals provided curtain-tearing sound effects. The overall effect was other-worldy. As this was the conclusion of the office, we left in silence. church. During the sermon, the cardinal presented a powerful image of stained glass as a metaphor for the church as a whole. 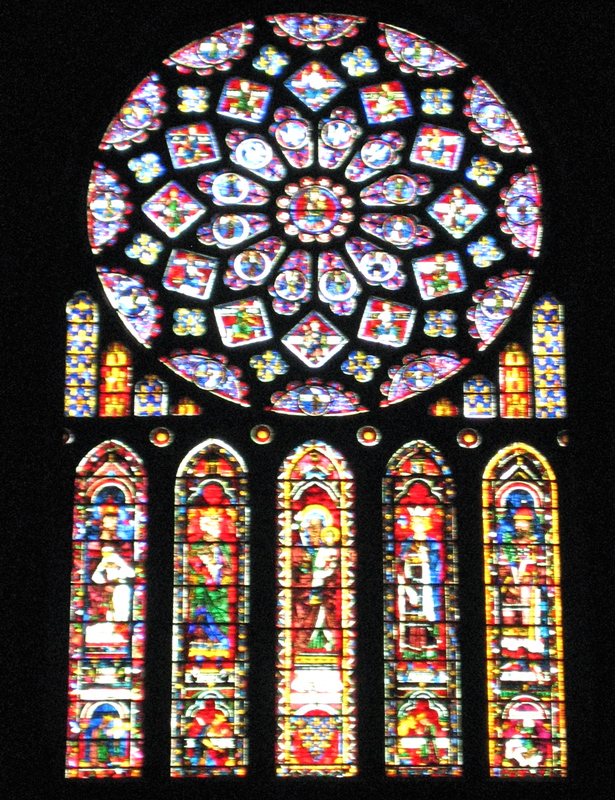 He said (and I think quoting JPII), that stained glass windows, when viewed from the outside, look drab and un-insipring. When entering the church, and, seeing the windows from the inside looking out, we experience their dazzling radiance and intricacy. So too is the church (and now I refer to the body of believers), often perceived from the outside as cold and uninviting (or overly inviting), it is not until we enter into the body and participate in community to we realize the intricacy and beauty of the collage of members. I can extend the metaphor even further (and indeed people have) to say that the members of the body, like fragments of glass, may be blemished and are in no way a complete picture, but when arranged together they form a complete image. Finally, Good Friday, at a service at Citylife church, I heard a fantastic sermon that basically preached the gospel (I can’t help but notice how the memorable element of the Evangelical service was the sermon, contrasted with the memorable moments of Catholic offices being for the most part liturgical gestures and sacraments). That being said, it was refreshing in its simplicity, yet still thought provoking. We mustn’t take the cross romantically, said the preacher. I was not quite sure what he meant by that, and found it strange juxtaposed with the Good Friday mass I attended, where a majority of the service was centered around “veneration of the cross.” During this point, the relic of the cross was brought out and displayed to the congregation, and congregants came forward and kissed the cross out of reverence and adoration. I’m not sure if this is what the preacher meant by “romanticizing the cross,” but it was very powerful to see an actually piece of the cross where my savior hung. Surely a sobering moment. But he didn’t stay in the grave! He has risen! Lent has been a fulfilling season of reflection (and giving up facebook…which might just stick), but as Christians, we celebrate his resurrection and await his return. As will always be the case, more thoughts on that to come. Happy Easter everyone! Adam Kurihara Create a free website or blog at WordPress.com.